As I noted in my last post, I've jumped on the Project Life bandwagon. I'm really looking forward to moving through the year with my project. I will end up using a variety of products in the end I'm sure. But to begin with, I'm sticking with what is simple and easy, and totally fits what I want to do. I've been doing a lot of planning already, and even prepared my title page. I've decided to attempt to do weekly spreads, though if time gets away, I will likely do them less often. For my title page, I wanted to keep things really simple. So, I pulled out some Year-O-Graphy and started with the printed 4x6 pages. I used very few embellishments except for some stickers and stamps. Here's how some of the elements turned out. I also took one piece of patterned cardstock, stamped the months of the year from the Simple Stories/Unity stamp line, and simply added a couple of stickers. Finally, I added a single photo with a couple of stickers and a note and I was done. Now, I'm totally set for the new year! I'll be sharing my progress throughout the year, and I hope you will join me in the PL journey! Have a save, healthy, happy new year Simple Stories fans! ETA: I'm so excited to see how many of you are planning on coming along this journey with me using Simple Stories! Please feel free to ask questions, but know that I am figuring it out as I go along as well. 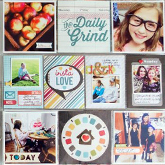 I will be using the Project Life design team to guide me and help me when I need it. It seems that everyone has jumped on the Project Life bandwagon this year. Project Life, a concept coined by Becky Higgins and born out of the Photo a Day idea, actually fits the Simple Stories system perfectly. The idea is to document the everyday, taking it in small chunks, such as daily or weekly happenings. I have a busy year ahead of me filled with change as I go from being a full time employee to a full time student. So, Project Life seemed like a great way to keep track of what a crazy year I know this is about to be. Then I realized that there was no better line to bring along on this journey than Simple Stories. Today, I'll give you a peek as to what I'm up to as I do some pre-planning and preparation for constructing my Project Life (PL) album. First, I decided to use the variety pack of page protectors from WeRMemory Keepers - which fit perfectly with the Simple Stories line. I went back and forth about 12x12 or 8.5x11, but in the end settled on a 12x12 album figuring if I wanted to do 8.5x11 I still could, but not the other way around. I chose an album with a cut out window on the cover so I could embellish it a bit. Here's a close up of the window. I simply cropped one of the preprinted cards, embellished a tiny bit and voila! Come back Friday to see the first page of my album! Whew! Are you feeling winded yet Simple Stories' fans? Happy Day After Christmas to you! We hope you've enjoyed the design team's December Daily albums as we headed into the Christmas holiday. But perhaps you're like me in that you haven't really jumped on the December Daily idea. Maybe you don't celebrate the holiday, maybe you are too busy, or maybe committing to a whole album for the month just seems like too much. Although I may not do an album, I do like taking time to reflect on the year just past... favorite photos, favorite events, most memorable moments. So, I decided to share my Best of 2011 project I made using the Simple Stories Year-O-Graphy line and some great Maya Road products, starting with the ATC Shadow Box. First, some close ups. I basically created this using the sheet of flash cards. Love how they almost just fit the little ATC chipboard pieces that then fit into the frame. I also love how the Year-O-Graphy stickers are mini-sized. So many little bits and pieces, just perfect for that final touch. A little distress ink to the frame, put the ATC pieces inside, and the whole project couldn't have taken more than an hour to complete. So, if you want a quick little end of year project, why not pull out some Year-O-Graphy and go to town? We have all had so much fun making our Decemeber daily albums, and it has been fun to see all the many different variations! We hope you have enjoyed seeing the many albums featured with the May Road chipboard albums. We also wanted to show you how easy you could make an album for yourself using the divided sheet protectors as well. It is so easy and so fast to put together, the one thing that I really like is that I could put it all together and when I have a minute over the Christmas break, I will get the pictures off of my computer and in the album for my kids to enjoy all year long! One of our very favorite traditions at our house is to cut down our own tree from the mountains. I can't wait to add the pictures of our giant Grizwald tree to this page! Thanks for stopping by today. We hope you all have a very Merry Christmas, and we can't wait for what we have coming up in 2012! It is going to be a great year with some fun surprises! Today we have 2 blog post for you! Creating this Countdown to Christmas album was a great way to help us get in the Christmas spirit. This post actually contains days 11-25, there are a lot of pictures to see, so sit back and grab a cup of hot chocolate, and enjoy all the flips and turns and little pockets inside my final Countdown to Christmas album. Enjoy your holiday season! Merry Christmas to all of you, and a very Happy New Year! Hiya Simple Stories fan!! Wendy back with my FINALE take on my December Daily using Simple Stories & Maya Road!! Seriously, I can't believe I did it! Always had the ultimate intention to complete it out but would start, get frustrated, get behind, and with my recent printer issues FINALLY made it happen for this December Daily. So, I'm super pleased to complete it out (with the exception of a few days left - 22 - 25 - to round out the 25 days) but all in all, DONE-zo! :) I still have my bits & pieces of journaling to do on the pages but the pictures will help with all that & I have my notes jotted down too to go back & add it in. Oh, on a side note, since I had printer issues with my initial post here. I'll re-share up those pages FIRST and so all flows down to the current to date. I'll pop in a bit here & there in the post to share up some tidbits with ya. Alrightee? ;-) Also, be sure to check out the supply list at the end of this post with LOTS of Simple Stories & the specific pieces I used from these collections; as well as all the fab fab Maya Road stash too. Check out the transparency filmstrip! FUN stuff, eh? That would be some Maya Road love! I layered some stamping under the transparency along with the perfet ticket stub stickers from 25 Days of Christmas. I LOVE these mini alpha stickers from Year.o.graphy. 3 colors choices come on the sticker sheet.LOTS of options! Here I clipped random bits & pieces from Year.o.graphy as well as layering some Maya Road ribbon, and bling paper. I think this is my favorite page so far in the Daily. I buckle in the knees over these resin flowers from Maya Road. to.die.for....just sayin'. I accented further with punched out circles from scraps of 25 Days of Christmas. Sweet birthday card I made for the lovely Stephanie Hunt. I simply love my 2 favorite lotions from Victoria's Secret - Sheer Love & Lost in Fantasy - they smell heavenlyyyyyy. LOVE my creative chaos? I create on a messy desk that inspires me with lots of my favorites but the daily life is super organized, weird, eh? LOVE these chipboard silhouettes from Maya Road. They were raw chipboard & I painted them with acrylic paint. I'm all about a fun chipboard alpha and these are from Maya Road too and I painted with acryic paint. There are so many fun elements to Year.o.graphy - checklists, etc. FUN! Here I took a restaurant menu from the take out counter and wanted to add it into my album. I covered one of the Maya Road chipboard album pages with the restaurant menu as my background paper. I even cut out the header above the pics from the front page of the paper menu. In dedication to my dad on passed away from cancer 6 years ago, Dec 20, 2005. And a splash of 25 Days of Christmas on the 24th & 25th - love this collection too! Check back later today/tomorrow & I will update this post with the FULL supply list of my December Daily album including the Simple Stories collections & all the fab fab Maya Road stash too. This Daily has been so fun & keeping me accountable in documenting in pics the bits & pieces into my daily grind. Also, fun selfies (aka self portraits) were lots of fun too. Hope you ALL have a super WONDERFUL & SAFE holiday with family & friends!! So, tell me, are you almost at the finish line with your Daily albums? Thank you so much to everyone for all the sweet comments you've been making about my album. I've had a really fun time putting it together and my family has enjoyed looking through it and enjoying the memories as well. I've got a few more pages for you today, then I'll wrap the rest of the album up next week. You can see my other two posts here and here. I've loved working with the 25 Days of Christmas line and all the fun Maya Road products, I hope you've been inspired! 17. Winter Wonderland. You know Christmas is here when you hear my mom bang this out on the piano. She has this fancy way of starting out and it's something I've tried to carry on in my own family. I copied the first few measures of the song and printed them out, an easy way to put an aural memory in a visual book. 18. Ginger Cookies, specifically the Lion House Ginger Cookies. The Lion House is a restaurant in Salt Lake City and they have the most delicious and unhealthy recipes out there. These cookies are THE thing that makes Christmas complete for me. I photocopied the recipe I stole from my mom's cookbook when I got married and left home. You can see I even wrote the title out wrong, crossed it out and kept going. The grease stain from years-old shortening is even visable. I love how this turned out. 19. We've had these snowflakes on our Christmas tree for years now, even with the changes from a purple/red/gold tree to our current pink/orange/pewter/turquoise/green/red tree, these have stayed constant. I just love the shimmer they add to the tree. 20. These berry sprigs have stayed with the tree decor as well. Not much else to say about them except they are a staple. For the background of the last two pages, I stapled some of these clear ledger transparencies in black. I once made a 12x12 background using this technique, you should try it, it's a cool look! and finally, I used the Satin Pleat Edging in cream. I love this stuff. Wishing you all a Merry Christmas and Happy Hannukah! See you next week! Countdown to Christmas - Part 3! Hello everyone! This is the final installment of my Countdown to Christmas December Album! I have had so much fun with this album, that I see more in my future. My favorite aspect? I know I've said this before, but it was just so quick and easy! All the credit for that goes to Simple Stories and their fabulous 25 Days of Christmas Collection! Honestly, the paper is terrific all by itself so very few embellishments are needed. Quick & easy for sure! For me, the key has been to share Christmas memories and not necessarily the days leading up to Christmas. Some days are crazy busy with multiple memories and others just are lazy days at home. I love the flexibility this has given me to add whatever memories I like regardless of when they occured. Memory #16 - Definitely need to document that I do occasionally get dressed up and put make-up on! This was for the Calvary Fellowship Women's Christmas Dessert. Memory #17 - This December, Jordan turned 21! A big milestone birthday! Memory #18 - Baking day at our house! This year, Sarah is 34 weeks pregnant with my first grandson! Memory #19 - Yummy brand new cookie recipe! Memory #20 - Some of the kids dressed up for their youth group Christmas party! Memory #21 - All my Christmas presents wrapped up and sporting tags made from the 25 Days of Christmas Collection! Memory #22 - Chase loves every aspect of Christmas and all the festivities! Memory #23 - My Christmas Vinyl which changes every year - this one is courtesy of Charlie Brown! Memory #24 - Austin all dressed up and ready for fun! All that is left is to add our family photo with Santa from Christmas Eve! Such a great keepsake - loved this project! I want to send a huge thank you to the great folks at Maya Road for sending us some wonderful product to work with - I loved it all, especially this fantastic album! Let's finish it up and get to celebrating the holidays! I can tell you that making a Countdown Album is an endurance activity. But, I also have to say that it has been a joy to work with both the Simple Stories 25 Days of Christmas collection and all of the goodies from Maya Road. Truth be told, I started to run out of my chipboard pages, so I decided to double up pages for the last week of my album. I was doing that on my weekends anyway, so I just completed the theme. We spent time with friends over the weekend, so the 17th and 18th are about friends, food and fun. I know I better hurry up and finish up my Christmas shopping today and tomorrow, so those two pages are a reminder that I need to get that done. I am so pleased with all of the different number options that come with the 25 Days of Christmas collection. I was able to change up the days to add more interest to my album and it worked out beautifully. Love how you can pair the Simple Stories Bingo Cards with the Maya Road Sheer Calendars. I wanted to add a photo of my daughter who just cannot wait to open her presents. I think she asks me every hour, so it is fitting to have her featured right before Christmas Eve when we will start to open presents. I also liked the idea of adding the Santa Bingo card along with the 23rd day on the cardstock sticker ornament. Love how pop dots or foam tape makes everything just a little better. This ornament totally jumps off the page. I added some little gems to the cardstock sticker Christmas tree. Please stay tuned this week as the rest of the Design Team will wrap up their mini albums too and then we can all get to celebrating! Thank you also for sticking with me. Below is a visual product list to see what I used to put together my mini ablum. Leave us a comment here on this post. Become our friend on Facebook and share this post on your Wall. Also remember to drop by Maya Roads Blog for more inspiration - and leave them some love on the Maya RoadFacebook Page (tell them Simple Stories sent ya).